Yet another Christmas has been and gone… and for this one I decided to stay at home and cook myself a Christmas dinner in my brand new kitchen! 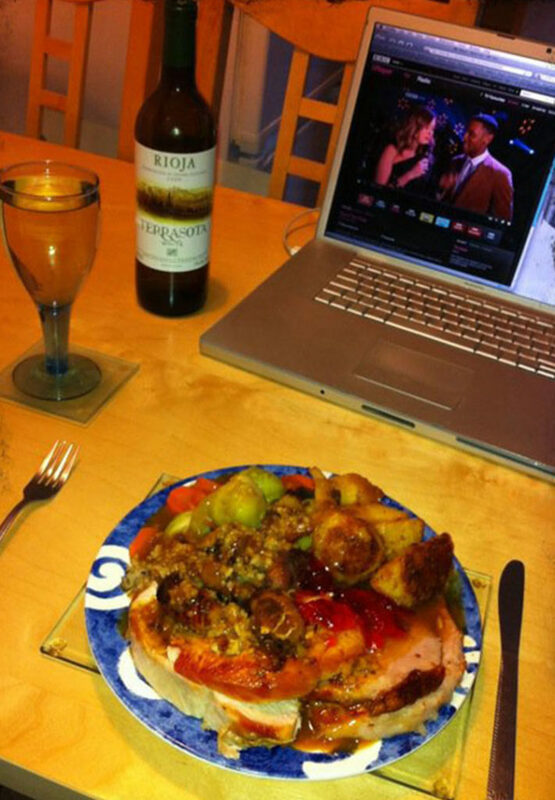 I think Christmas dinner has to be the best meal you can have! It has so many different things in it, and you’re kind of allowed to over-eat for that one meal! I cooked a joint of turkey and a joint of gammon, and also had he full works with sausagemeat stuffing, bacon wrapped around sausages, roast potatoes, and loads of veg! It was washed down with a nice glass of wine whilst watching Christmas Top Of The Pops on iPlayer live on my laptop! And by the time the Christmas pudding made it onto the table, I couldn’t have been more festive if I’d tried! Once I’d had my dinner I just relaxed and watched TV for the rest of the day! It was a proper lazy day, and I did actually enjoy it! And last week, just before New Year, I popped down to Tamworth to visit my mum, sister and the twins, and give them their Christmas presents. I bought Brandon and Chloe some Lazy Town costumes – a Sportacus suit for Brandon, and a Stephanie outfit for Chloe. The only problem was that it freaked them out a little bit! Obviously they’re so used to seeing those characters on the TV that they couldn’t get their heads around the fact that they could dress up as them! Maybe they’ll play with them sometime in the future, but I don’t reckon they’ll get much use in the immediate future! And in other news, I’ve bought a new TV for my living room! I’ve had a big widescreen CRT for about 10 years and I thought it was time to get myself a HD set. I’ve bought a Samsung 37″ Freeview HD internet TV – and it’s got BBC iPlayer and YouTube built in. I’m quite pleased with it… now I just need to get Sky HD and a Bluray player! ← Previous Post America – YEAH!